Tell someone you're making a game and pretty much their first question is always: For what platform? It's a good question. After all, who cares about a game if you never get to play it. Knights and Ruffians is going to be web based. The reason is this simple: I want everyone to be able to play it. The underlying technology is Adobe's Flash, so I suppose technically when I say "everyone" there I mean "everyone except people with iPads". That's a shame, but Mr Jobs assures me you hip cats wouldn't dream of playing a game without multitouch anyway. 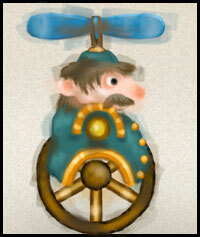 As well as web deployment I'm also trying something new with this game… it's going to be episodic. And by episodic I don't mean like Half Life has become with very infrequent episodes. Nor do I mean like Sam and Max. I mean more like a webcomic, with weekly episodes. I suppose you could almost think of Knights and Ruffians as being like a playable webcomic. Has anyone done this before? If not, maybe you're thinking that this sounds crazy or even impossible. The reason why it isn't is because I'm not talking about ten hour episodes here. Each week's episode will be really short. The experience will be more like playing a level of a game than playing an entire game. And no, there won't be groundbreaking new game features in every episode. But nor will there be filler. The idea is for each week's new episode to be compact but fun. People don't always have lots of free time, so I don't want a big time commitment to be necessary to play every week. The other key question which needs resolving after platform is payment. Well, I want everyone to be able to play it, so it has to be free. End of story. Well OK, that's not quite the end of the story because I'm an evil money-grubbing developer who likes to indulge in such shameful luxuries as eating food and having a roof over my head. But I'm serious about making it free. If there's one thing all the endless drama about pirates has taught me it's that it's better to persuade people to pay you than to try to insist. Where Knights and Ruffians is concerned that means identifying worthwhile things I can provide to players willing to pay without spoiling the fun for those who cannot or choose not to. Fortunately there are quite a lot of things that can be done here without being evil. The most obvious one is enabling customization and variation. 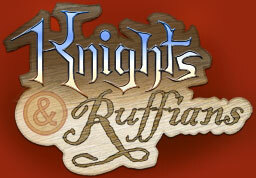 Knights and Ruffians, like a webcomic, will feature characters scripted by the authors of the episodes. There's no reason why players can't pay to play with alternate characters or even design their own instead of using the canonical ones. Such payments wouldn't be per episode, so the cost to the player would still be very low. 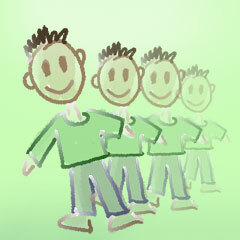 Another possibility is multiplayer. A small one-off cost to let you play through episodes with your friends should again not spoil the experience for solo players. Last but not least, access to old episodes is something I'm likely to charge for. Not the previous week's episode, of course, but if someone wants to go back 100 weeks and play catch-up then I want to be charging something for it or my server bills are going to be a problem. Longer term I might also release downloadables such as an entire series as a standalone executable or even a level editor. I have a lot to say about level editors. Maybe another time. Remember when I said this game was going to be big? Well, the truth is I literally have no idea how big. If the concept turns out not to work, maybe I'll never get past half a dozen episodes. But if it does… what's it going to look like after several years?! Exciting. And a bit scary. But it's the kind of project where having come up with it I can't let go of the idea.